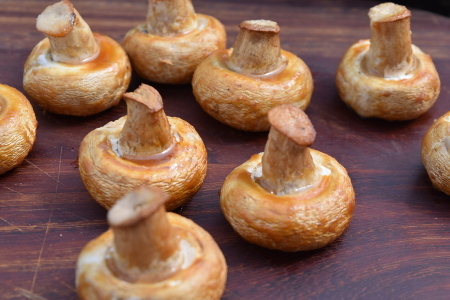 This barbecue miso mushrooms recipe is one of the easiest things to cook on the barbecue! With a delicious yet simple marinade mixed with the aroma of the charcoal smoke, they make a fantastic snack for any occasion. This is a tried and tested recipe that my dad has used for years, and due to the flavourful marinade these mushrooms have always been a hit. So why miso? Simply put, we love it. Miso has such a rich umami flavour which is perfect for enhancing our barbecue veggies; you’ll see it make another appearance in my smoked miso aubergine recipe. This Japanese soy-based food is also known to have various health benefits, although I’m no expert, so see here for some more information about miso. 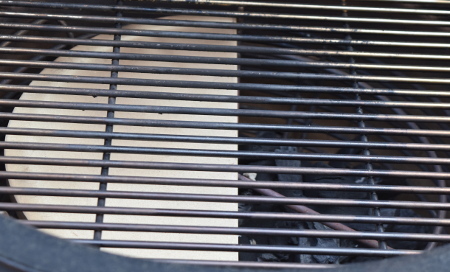 This recipe requires barbecuing the miso mushrooms using indirect heat, so we’ll need a heat deflector stone between the charcoal and the mushrooms on the grill. If you have a stone that split into two halves (as shown below on our Monolith), then you can grill some other barbecue food as the same time as roasting these barbecue miso mushrooms! Serves 4. Prep time: 5 minutes. Cooking time: 20-30 minutes. Allergens: soy (miso paste, soy sauce). For this recipe, due to miso being almost always derived from fermented soybean, there’s really no getting past the soy, sorry! 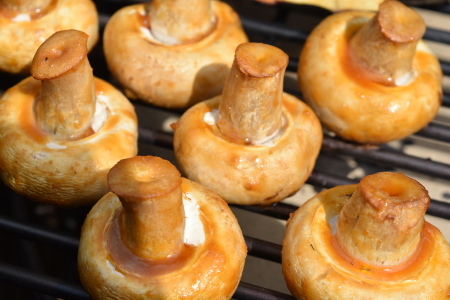 Seeing as these mushrooms take next to no time to prepare, start by lighting the barbecue. Seeing as we’re barbecue roasting, we only need a temperature of around 160°C – don’t forget to put a heat deflector stone between the coals and the grill! Mix together the miso paste, brown sugar, lemon juice and soy sauce in a small bowl. Et voilà, the marinade is ready! Take each of your mushrooms by the stem and dunk them into the marinade before popping them straight onto the barbecue grill. If you have any marinade left over, use a pastry or basting brush to just coat the tops and stems of the mushrooms with the miso marinade. 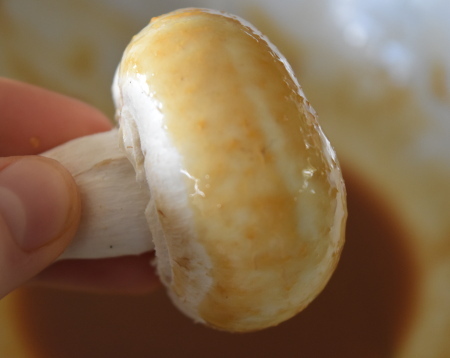 Cook the miso mushrooms for 20-30 minutes over indirect heat, until the mushroom skins start to wrinkle. When taking the mushrooms off the barbecue, they may stick a little bit to the grill due to the sticky marinade – fear not, just use a spatula to ease them off. Your barbecue miso mushrooms are now ready to eat! They are perfectly good as a stand-alone snack served on a cocktail stick, but you can also slice them and mix them into a salad on put them on a sandwich – whatever you fancy. Enjoy!